Mary Alden’s Cook Book for Children, Wonder Books, 1955. Cardboard cover, 64 pages. As close to a mint condition copy as we’ll ever see, I suspect. Cover is intact, although in has a corner that’s been bent and some minor wear along the spine. All pages are clean and clear. 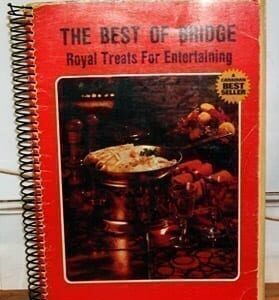 Should bring back happy memories, if you had this cookbook as a child. Mary Alden’s Cook Book for Children, Wonder Books, 1955. Cardboard cover, 64 pages. As close to a mint condition copy as we’ll ever see, I suspect. Cover is in nearly perfect shape. All pages are clean and clear. Binding is perfect. First edition, first printing. Should bring back happy memories, if you had this cookbook as a child. Your granddaughter will love it!